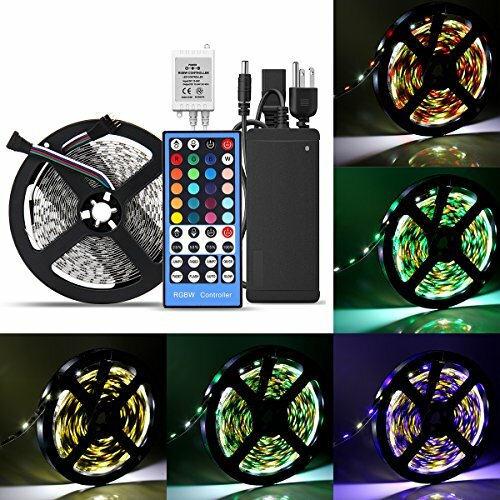 SUPERNIGHT LED Light Strip, Color Changing 16.4ft RGBW LED Strip [SMD 5050 DC 12V 300 Leds] With 40-Keys IR Controller & Power (Can Be White Color, RGB Color, RGB+White Color, All In One Strip) by SUPERNIGHT at 4 The Fort. MPN: EBT458,EBT348,SC-044-11. Hurry! Limited time offer. Offer valid only while supplies last. Standard kit: This package comes with a reel of 16.4ft RGBW led strip, a remote controller with sensor and a power supply. Just plug and use. RICH COLOR: Color changing with 20 solid single colors includes white color, also available in romantic RGB+White color, with dimming and brightness controls is ideal for home decoration. Easy Installation: Plug and play without wiring - This LED strip light can be cut between every 6 LEDs without damaging the rest strips., and it is cuttable also linkable. self-adhesive back can be fit many dry flat surface. Save effort and maintenance costs on changing. Low power consumption: 12V working voltage, low power consumption and extremely low heat. Tips,The strip lights are Non-waterproof,can only be used indoor. Must unroll the strip light off of the plastic stand first before using.